Over 3,000 samples of plastic litter have been retrieved from 12 pebble beaches around the shores of Lake Geneva. The plastic stock consisted of identifiable objects of various size and color, including bottles, bottle tops, cotton buds, pens, toys, and straws, an heterogeneous assortment of fragments whose origin was either discernible or unknown, and pieces or blocks of expanded polymer (polystyrene or polyurethane foam). Analysis of 670 samples by portable x-ray fluorescence (XRF) spectrometry revealed high concentrations of hazardous elements or compounds among many plastics. These included Cd, Hg, and Pb (with maximum concentrations of 6,760, 810, and 23,500 ppm, respectively) as stabilizers in PVC-based materials and/or brightly-colored sulfide or chromate pigments in primary and secondary plastics, and Br (with a maximum concentration of 27,400 ppm) as a proxy for brominated flame retardants (BFRs) in both plastics and foams. The abundance of hazardous elements in beached plastics that have been restricted or banned reflect the age and residence time of the plastic stock in the lake, coupled with a relatively high length of shoreline to surface area of the system. The migratability of hazardous elements from the polymeric matrix is likely to determine their environmental impacts and is recommended as a future area of research. The accumulation and impacts of anthropogenic litter in marine environments has been well-documented and publicized over the past few decades. In contrast, and despite often easier and more ready access, littering in the freshwater environment has received far less attention, with systematic investigations of rivers and lakes appearing in the literature only recently (Eriksen et al., 2013; Imhof et al., 2013; Hoellein et al., 2014; Klein et al., 2015; Turner and Holmes, 2015; Zhang et al., 2015, 2016; Cable et al., 2017). Although they share many similarities with the oceans in terms of usage and anthropogenic pressures, lakes have a smaller fetch, greater enclosure, higher ratio of shoreline to open water, smaller (if any) tidal or haline influence on circulation and transport, and greater sensitivity of water characteristics to local weather conditions. Anthropogenic inputs in lakes are, therefore, likely to be more localized and characterized by a greater land-based and direct human signatures, with a higher proportion of buoyant litter, and in particular low density plastics, ending up beached at the land-water interface (Hoffman and Hittinger, 2017). Regardless of their precise source, plastics deposited on the shores and beds of lakes and suspended in the lentic water column are likely to pose the same problems to wildlife as marine plastics. In this respect, entanglement and ingestion are of greatest concern, with the former having the propensity to suffocate, impair mobility, disrupt feeding and maim, and the latter posing a significant risk of obstruction or damage to the linings of digestive tracts and, through reduced feeding drive, starvation (Gregory, 2009). Ingestion also has the potential to transfer toxins associated with polymers to organisms that consume plastics either directly or through contaminated prey. The majority of studies in this area have targeted persistent organic micropollutants, like polychlorinated biphenyls and polycyclic aromatic hydrocarbons, that are sorbed to the plastic surface (Frias et al., 2010; Rochman et al., 2013; Gauquie et al., 2015; Ziccardi et al., 2016; Hong et al., 2017). However, attention has recently been paid to the occurrence and impacts of chemical elements in litter, like metals, metalloids and halogens, that are either adsorbed to the plastic or incorporated into the polymer itself (Boucher et al., 2016; Brennecke et al., 2016; Nakashima et al., 2016; Turner, 2016; Turner and Solman, 2016). While recent empirical evidence and models suggest that the exposure and accumulation of adsorbed compounds or elements may have been overstated in the literature (Herzke et al., 2016), inorganic additives of the plastic matrix, including flame retardants, catalysts and heavy metal-based pigments, appear to represent a more significant source of contaminants to the foodchain (Rani et al., 2015; Massos and Turner, 2017). In order to improve our understanding about potentially toxic elements present in plastics in the lentic environment, the present study determines their concentrations in plastic litter collected from 12 beaches around Lake Geneva (or Lac Leman), one of western Europe's largest bodies of freshwater. Selected samples are analyzed by portable x-ray fluorescence (XRF) spectrometry using established and validated protocols (Turner and Solman, 2016) for the discrimination of PVC- and non-PVC-based materials and the presence and concentration of elements that are restricted in plastics according to EU Directive 2002/95/EC on the Restriction of Hazardous Substances (RoHS, 2006) and are potentially hazardous to wildlife; namely, the heavy metals, Cd, Hg, and Pb, and the halogen, Br, as a proxy for brominated flame retardants (BFRs). Other, ancillary metals and metalloids (As, Sb, Se, and total Cr) are also considered because of their restriction according to other European Directives (e.g., 2009/48/EC on toy safety; European Parliament and the Council of the European Union, 2009) or whose co-association with the principal elements provides evidence for the types of pigments or retardants present. Lake Geneva is an elongated, mesotrophic, perialpine lake at an altitude of 372 m above mean sea level whose catchment area of 8000 km2 (including the lake itself) houses a resident population of about 1.1 M according to 2011 data (CIPEL, 2017). With a surface area of 580 km2, a maximum length and width of 72.3 and 14 km, respectively, and a maximum depth of 310 m, it has a water volume of 89 km3, making it one of the largest lakes and largest freshwater reservoirs in western Europe. The main tributaries to the lake are the Rhône and Dranse rivers, and the theoretical residence time, based on volume and freshwater input is about 11 years. Twelve pebble beaches along the Swiss and French shores of Lake Geneva (Figure 1 and Table 1) were sampled for the present study. Since the lake is heavily used for recreational purposes and most of the beaches are routinely cleaned, particularly in summer, sampling took place on 3 consecutive days in mid-March (and before the Easter holiday break) in 2016. Despite targeting a period outside of the main holiday season, however, organized litter cleaning was witnessed on some of the Swiss beaches, resulting in a lower amount of material retrieved at these locations. Although litter tended to accumulate with wood and other natural debris along strand lines, all material across the entire beach that was visible at the surface to the naked eye and that was wholly or largely constructed of plastic was retrieved by hand. Samples from each beach were returned to the laboratory in a series of clear, polyethylene zip-lock bags where they were cleared of any visible extraneous material, grouped according to sample site, counted, photographed and weighed. Figure 1. Location of the 12 beaches sampled in Lake Geneva. Table 1. Name and location of each beach and information about the number (and average weight) of samples retrieved and the number of XRF analyses performed. Selected samples of various size, color, and texture from each location were analyzed by energy-dispersive XRF using a battery-powered Niton analyser (model XL3t 950 He GOLDD+) for a suite of elements, of which As, Br, Cd, Cl, Cr, Hg, Pb, Sb, and Se are the focus of the present study, under operating conditions described and validated elsewhere (Turner and Solman, 2016). Briefly, the instrument was configured in a plastics mode that is capable of quantifying elemental concentrations in complex, low density materials through a fundamental parameters-based alpha coefficient correction model and a thickness correction algorithm down to 0.05 mm. The XRF was employed in the laboratory in a bench-top accessory stand and was operated remotely by a laptop via USB. The surface of the sample to be probed (usually the thickest and flattest part) was positioned centrally over the detector window on 3.6 μm polyester film before measurements, with 8-mm collimation and appropriate thickness correction, were activated through the laptop for a total period of 120 s (60 s each at 50 kV/40 μA and 20 kV/100 μA). Spectra were quantified by fundamental parameters to yield elemental concentrations on a dry weight basis (in ppm) and with a counting error of 2σ (95% confidence). For quality assurance purposes, two Niton reference plastics (PN 180-619, LOT#T-18, and PN 180-554, batch SN PE-071-N) were analyzed likewise and at regular intervals during each measurement session. A comparison of mean measured concentrations and certified values, shown in Table 2, reveals agreement to within 10% in all cases with the exception of Sb in the former disc; here, the mean measured concentration was 15% lower than the average certified value. Table 2. A comparison of measured and certified concentrations of elements in two Niton reference plastic discs, with errors representing two standard deviations about the mean in all cases. Measurement limits of detection of the Niton XL3t are dependent on a number of factors, including analyte fluorescence intensity, mode of instrument application, counting time, and sample density, composition and thickness. For the samples considered here and under the operating conditions described above, detection limits were generally lowest and below 10 ppm for As, Br, Cr, and Pb and highest and above 70 ppm for Ba, Sb, and Sn. Note that in the case of As, overlap of its Kα fluorescence peak with the Lα peak of Pb coupled with the relatively low intensity of the As-Kβ line means that concentrations cannot be effectively calculated for samples with Pb:As ratios in excess of about 10 (Environmental Protection Agency, 2007). Arsenic concentrations reported herein are, therefore, restricted to those returned by the XRF where Pb was not detected. Fourier transform infra-red (FTIR) spectroscopy was employed to obtain a high resolution infrared spectrum of absorbance by the samples that identifies the type of polymer/s present. Thus, based on the XRF results, selected samples (n = 40) were determined by FTIR using a Bruker ALPHA Platinum attenuated total reflection QuickSnap A220/D-01 spectrometer. Sample offcuts of up to about 20 mg were clamped down on to the ATR diamond crystal before measurements, consisting of 16 scans in the range 4000–400 cm−1 and at a resolution of 4 cm−1, were activated via Bruker OPUS spectroscopic software. Identification involved a comparison of sample transmittance spectra with libraries of reference spectra. Data from the XRF were converted to Excel files using Niton Data Transfer (NDT) software. Regressions and correlations were performed in Excel 2010 using the data analysis ToolPak add-in, with an alpha level of 0.05 adopted as a measure of defining statistical significance. The majority of anthropogenic material observed on each beach was plastic, with manufactured wooden and metallic debris present in lesser quantities and glass entirely absent. The plastic items retrieved from the 12 locations are illustrated in Figure S1 and quantified in Table 1 in terms of total number, number analyzed by XRF and average weight. Overall, 3,349 samples were collected, with a total mass of about 4 kg. Items could be classified as primary plastic objects that were usually identifiable (e.g., bottle tops and stoppers, straws, cotton buds, cartridges, clothes pegs, toys, pens, cigarette lighters, cable ties), secondary plastic fragments that were identifiable (e.g., irregular pieces or remains of wire insulation, piping, taping, plant pots, sheeting-wrapping, food wrappers, cups, and bottles), secondary plastic fragments that were unidentifiable, or fragments of expanded plastic (hereafter referred to as foam) that were unidentifiable. XRF analysis was restricted to 670 items because of time and resource constraints, with measurements prioritized on the basis of sample variety and reduced by avoiding items that were visually similar in construction, texture and color, both within and between different sites. The number of items retrieved and the distribution of items in terms of classification and size varied considerably among the beaches and with no clear geographical pattern. For instance, the plastic stock at Petite Rive was dominated by primary plastics but at Rupalet comprised a high proportion of secondary fragments, and while foams were absent from Crans-près-Céligny and comprised a low proportion of the plastic pool at La pêcherie they were abundant on the beaches at Rupalet and Les marines; plastics at La pêcherie were also dominated by a high number of small items whereas those at Rupalet comprised far fewer items that, on average, were considerably larger. Variations in the amount and type of plastic accumulated among the beaches may be attributable to many factors, including proximity to inhabited areas and tributaries, recent history of beach cleaning, circulation, and currents in the lake and beach aspect and slope, but a detailed analysis and source apportionment was not the objective of the present study. 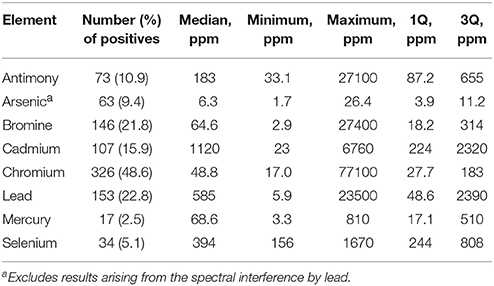 Table 3 shows the frequency of detection and summary statistics for the hazardous elements and ancillary elements in all beached lake plastics analyzed by XRF, while Figure 2 illustrates, in ascending order, all concentrations returned for Br, Cd, Hg, and Pb, along with photographs of samples with the highest concentrations and/or that exceed respective RoHS limits. Table 3. Frequency of detection and summary statistics for the hazardous elements in beached Lake Geneva plastics. Figure 2. (A) Distribution of measured bromine concentrations. The picture shows all objects with concentrations higher than 1,000 ppm and in descending order from left to right and from top to bottom. (B) Distribution of measured cadmium concentrations. The picture shows all objects with concentrations higher than 100 ppm and in descending order from left to right and from top to bottom. (C) Distribution of measured mercury concentrations. The picture shows all objects with concentrations higher than 100 ppm and in descending order from left to right and from top to bottom. (D) Distribution of measured lead concentrations. The picture shows all objects with concentrations higher than 1,000 ppm and in descending order from left to right and from top to bottom. Bromine was detected in over 20% of the samples analyzed, with concentrations ranging from about 3 to 27,000 ppm. Concentrations of total Br exceeding 1,000 ppm were encountered in 21 items that are photographed in Figure 2A and that were either fragments of foam or neutrally-colored or green primary and secondary plastics. Based on Cl content returned by the XRF, none of these samples was of PVC-construction, with FTIR analysis revealing that foams were polyurethane- or polystyrene-based and that remaining samples were composed of polyethylene, polypropylene or acrylonitrile butadiene styrene. Bromine is used in some plastics in the pigment copper phthalocyanine (Lewis, 2004), explaining its occurrence in the two green items illustrated in Figure 2, but its use in BFRs, often in association with Sb-based flame retardant synergists, accounts for its presence in the remaining samples. Here, BFRs may have been added deliberately to items requiring flame retardancy, like soft furnishings, electronic casings, and insulating materials, or incorporated inadvertently into items not requiring flame retardancy, like flotation aids and food packaging, via contamination of the recyclate stream (Turner and Filella, 2017). Where Sb was detected among these samples (n = 7), the two elements exhibited a significant relationship (Figure 3A), with a gradient of about 3.5 that is similar to the mass ratio of Br:Sb in plastics impregnated with many historical and contemporary BFRs (Papazoglou, 2004; Turner and Filella, 2017). Assuming that Br occurs in the form of one or more restricted brominated compound in samples that are not green, at least 19 items retrieved from the lake are potentially non-compliant with respect to the RoHS limit for BFRs of 1,000 ppm. Figure 3. 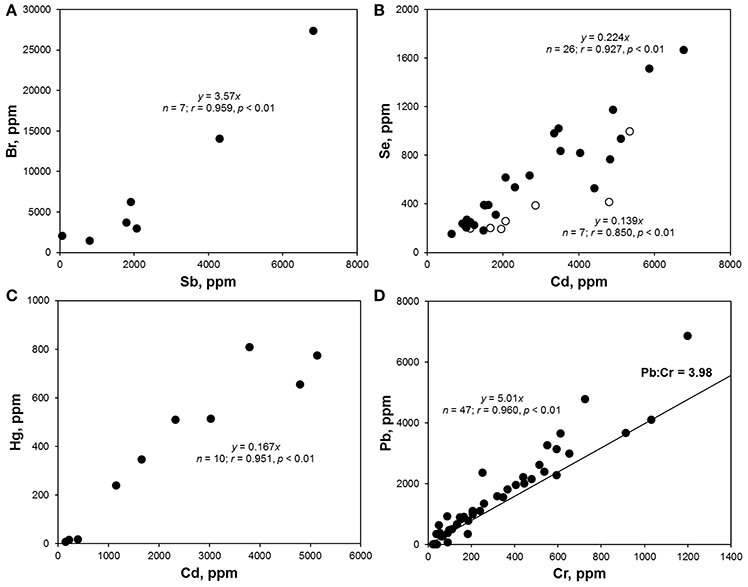 (A) Br vs. Sb concentrations in samples where Br > 1,000 ppm; (B) Se vs. Cd concentrations in red (•) and orange (◦) plastics; (C) Hg vs. Cd concentrations in Hg-positive samples; (D) Pb vs. Cr concentrations in non-PVC-based samples that were not colored green; the line corresponds to the mass ratio of Pb to Cr in pure lead chromate. Note that parameters defining the best fit regression lines are annotated on each panel. Cadmium was detected in about 16% of lake samples analyzed by XRF, with concentrations ranging from about 20 to 7,000 ppm, and exceedance of the RoHS limit for Cd in plastics of 100 ppm occurred in 57 samples which are photographed in Figure 2B. The heavy metal was never detected in foams and was most frequently encountered in brightly colored (and green, yellow, orange, and red) plastic objects and fragments that FTIR indicated were generally polyethylene-based; Cd also occurred in a limited number neutrally-colored fragments that were usually of PVC construction. The presence of Cd in PVC may be attributed to its use as a stabilizer in the form of a stearate or laurate (Titow, 2012), while its widespread occurrence among colored plastics is a consequence of the brilliance and light-fastness of the pigments, cadmium yellow (CdS), and cadmium red (CdSe). Thus, the former was employed in plastics to provide a bright yellow color, with progressive replacement of S by Se resulting in successively darker hues of red and combination with viridian (Cr2O3·H2O) providing a range of light greens (Rangos, 2004). Accordingly, and amongst the Cd-positive lake samples, Se was only detected where red or orange was the principal color while Cr was detected across a variety of green items. Quantitatively, the relationships between Cd and Se concentrations, shown in Figure 3B, could be defined by a slope that was greater for red samples (Cd:Se = 0.224) than for orange samples (Cd:Se = 0.139), while concentrations of Cd and Cr were statistically unrelated. The present study appears to be the first to provide systematic data on Hg in plastic litter in the aquatic environment. Thus, while traces of the metal were detected in various samples, concentrations above 100 ppm, and as photographed in Figure 2C, were restricted to plastic objects and fragments that were always red or reddish-brown and, where analyzed by FTIR, of polyethylene construction. Mercury has been used as a catalyst in some polyurethanes, accounting for residues in a number of foams sampled herein, but it does not appear to have had widespread use as a pigment in plastics (Hansen et al., 2013). As part of a literature review into solid products in municipal waste that contain Hg, the US EPA (1992) found no published data on the use of Hg-based pigments but suggested that most of those manufactured were likely used by the plastics industry. A subsequent synopsis of color pigments in plastics by Rangos (2004) mentions Hg-Cd pigments that were developed in the 1950 s as a more cost-effective and brighter alternative to cadmium sulphoselenides, with Hg replacing part of the Cd and eliminating the requirement for Se in providing a color range from deep orange to maroon. However, being inferior to sulphoselenides in terms of light-fastness and heat stability, Hg-based pigments never gained popularity. Regarding the lake samples measured here, Cd was present in 10 red plastics where Hg was detected, and in all items where the concentration of Hg exceeded 100 ppm, with Se present in just one case. Overall, concentrations of the two heavy metals were significantly related (Figure 3C), with a slope of 0.167 that affords an insight into the chemical makeup and stoichiometry of the pigment encountered herein. Lead was detected in almost one quarter of all samples analyzed, encompassing a wide variety of primary and secondary plastics in terms of size, color and polymer, and in fragments of polyurethane foam. Concentrations ranged from about 5 to 24,000 ppm, with exceedance of the RoHS for the metal of 1,000 ppm occurring in 65 cases and as illustrated in Figure 2D; samples above 5,000 ppm were dominated by PVC-based materials and those below, where measured by FTIR, were constructed largely of polyethylene. The presence of Pb in PVC reflects its use as a stabilizer in compounds like lead sulfates and lead stearates (Titow, 2012), while its occurrence in polyolefins may be attributed to the use of various leaded pigments that include cremnitz white ((PbCO3)2·Pb(OH)2), red lead (Pb3O4), and chrome yellow (PbCrO4), with orange and red variants of the latter being effected by the addition of PbSO4 or PbMoO4 (Hummel, 2002; Rangos, 2004). There was a striking, significant relationship between Pb and Cr in samples that were non-PVC-based and not green (where Cr in its lower oxidation state is often used as a pigment) with a slope of 5.01 that is marginally greater than the mass ratio of Pb:Cr in pure lead chromate (about 4; Figure 3D). This suggests that lead chromate and its variants have commonly been employed, in whole or in part (e.g., with Cd-based pigments), to color plastics retrieved from the lake that are yellow, brown, red, or orange. The present study is one of only a limited number that have published information on plastics in western Europe's largest lake (Faure et al., 2012, 2015) or addressed the occurrence of hazardous elements associated with different polymeric matrices in freshwater (Imhof et al., 2016). Several of the findings of our investigation are similar to those arising from studies of beaches in Atlantic Europe; specifically, there is a heterogeneous assortment of primary and secondary plastics and foams, coupled with a plastic pool that is dominated by polyolefins and with a relatively low abundance of higher density materials like PVC which, presumably, has a propensity for sedimentation (Turner, 2016; Fok et al., 2017; Massos and Turner, 2017). Unlike marine plastic surveys, however, there was an absence of primary production pellets and very little filamentous commercial fishing waste, like rope, netting, and cord, retrieved form the shores of the lake. Production pellets are often the dominant form of plastic waste on oceanic beaches on a number basis and, with respect to microplastics (<5 mm in diameter), on a mass basis (Massos and Turner, 2017), with the principal sources related to spillages during transportation (including shipment at sea) and improper handling at processing facilities (Duis and Coors, 2016). Lack of commercial plastic transportation on the lake coupled with efficient waste water treatment in the catchment may account for a limited supply of pellets to the system (Driedger et al., 2015), with a coarse-grained substrate acting to sieve out any residual pellets and other microplastics from the beach surface. Regarding filamentous debris, and compared with the marine environment, smaller-scale commercial fishing operations and more quiescent conditions ensure that there is less scope for losing gear and a better chance of its recovery, while a limited number of registered users means that there is a greater responsibility and incentive to retrieve fishing waste. Compared with equivalent studies conducted on marine beaches (Turner, 2016), hazardous elements appear to occur in higher abundance in plastics retrieved from Lake Geneva. 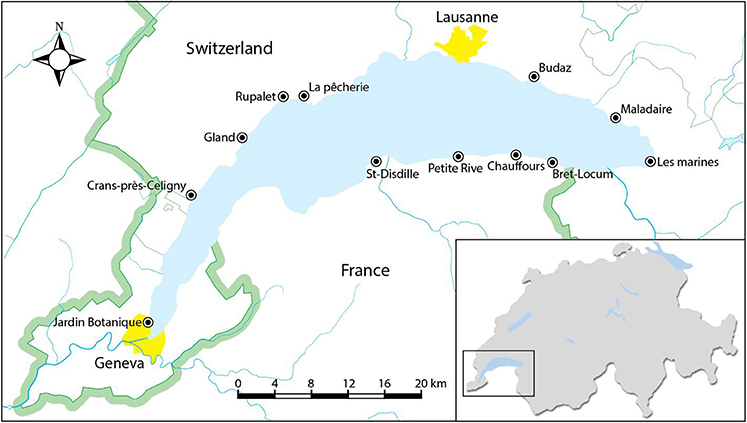 Since many of these compounds have been restricted or phased out over the past few decades (Hansen et al., 2013), we may infer that a significant proportion of the plastic stock in Lake Geneva is historical; specifically, the presence of Hg-based pigments suggests that some materials are at least 60 years old. While this does not necessarily imply that such plastics have been in the lake for this length of time, significant rounding and discolouration of most expanded foam samples from the lake is consistent with the protracted periods of weathering and erosion. Moreover, modeling studies in other lakes suggest that buoyant plastics may reside in enclosed water bodies for timescales considerably longer than hydraulic flushing times (Cable et al., 2017), meaning that the entrapment of low density plastics for decadal periods is entirely feasible in Lake Geneva. The impacts of hazardous elements and compounds in plastics are largely related to their propensity to migrate from the polymeric matrix and accumulate in biota and there are three potential means by which this may take place. Thus, first, a chemical may slowly leach into the surrounding aqueous medium while plastic is suspended in the water column, providing a general increase in its concentration and availability. Since additives, including pigments, are not designed to leach from plastics, this process is predicted to be slow and of limited importance in circulating water, even after the surface has become weathered and abraded (Nakashima et al., 2016). Secondly, and more significantly, small suspended plastics may be ingested by organisms mistaking items for food, with chemical accumulation occurring via partial but accelerated dissolution under the acidic or enzyme-rich conditions of the gastro-intestinal tract (Massos and Turner, 2017). Although the beached plastics retrieved from Lake Geneva were relatively large because of the sieving effect mentioned above, smaller (non-fiber-type) microplastics that are significant in the water column (Faure et al., 2015) are likely derived from and have a chemical signature similar to the material characterized herein. Thirdly, it is possible that invertebrates may accumulate hazardous chemicals by inhabiting static (e.g., trapped) or moored plastics or by grazing on associated biofilms. For instance, Jang et al. (2016) recently showed that marine mussels inhabiting styrofoam buoys were able to accumulate the BFR, hexabromocyclododecane, that had been impregnated in the polymer during its manufacture. The present study is among the first to describe both the type and characteristics of beached plastics in Lake Geneva and the occurrence of hazardous elements in fresh water plastic litter. The results reveal the ubiquity of restricted hazardous elements and compounds, including BFRs, often in association with antimony-based synergists, and cadmium-, mercury-, and lead-based stabilizers and/or pigments, among primary and secondary plastics and fragments of foam. The abundance of hazardous elements in beached lake plastics may be attributed to the decadal residence times of low density material in the lake, the age of the plastic stock in the system and the relatively high length of shoreline to surface area of the enclosed water body. The impacts of plastic-bound toxic elements on lake wildlife are unknown but should form the basis of future empirical investigations. MF: sampling, analysis, writing paper; AT: analysis, writing paper. We thank Juan Carlos Rodríguez-Murillo (CSIC, Spain) for invaluable help in the sampling campaign and Laia Bonet (ETHZ, Switzerland) for the processing of the photographs. Mr. Rupert Goddard (PU) is acknowledged for technical assistance with the portable XRF. Figure S1. This figure is a photographic catalog of the beaches and samples retrieved from Lake Geneva. CIPEL (2017). Programme Quinquennal 2011-2015. Campagne 2016. Rapports sur les Etudes et Recherches Entreprises dans le Bassin Lémanique. Nyon: CIPEL. Environmental Protection Agency (2007). Method 6200 - Field Portable X-ray Fluorescence Spectrometry for the Determination of Elemental Concentrations in Soil and Sediment. Available online at: https://www.epa.gov/sites/production/files/2015-12/documents/6200.pdf (Accessed June, 2017). Faure, F., Corbaz, M., Baecher, H., and De Alencastro, L. F. (2012). Pollution due to plastics and microplastics in Lake Geneva and in the Mediterranean Sea. Arch. Sci. 65, 157–164. Hansen, E., Nilsson, N. H., Lithner, D., and Lassen, C. (2013). Hazardous Substances in Plastic Materials. Oslo: COWI and the Danish Technological Institute on behalf of The Norwegian Climate and Pollution Agency. Hummel, D. (2002). Atlas of Plastic Additives: Analysis by Spectrometric Methods. Berlin: Springer. Lewis, P. A. (2004). “Organic colorants,” in Coloring of Plastics: Fundamentals, 2nd Edn, ed R. A. Charvat (Hoboken, NJ: John Wiley), 100–126. Papazoglou, E. S. (2004). “Flame retardants for plastics,” in Handbook of Building Materials for Fire Protection, ed C. A. Harper (New York, NY: McGraw-Hill), 4.1–4.88. Rangos, G. (2004). “Inorganic colored pigments,” in Coloring of Plastics: Fundamentals, 2nd Edn, ed R. A. Charvat (Hoboken, NJ: John Wiley), 127–145. RoHS (2006). Restriction of Hazardous Substances, EU Directive 2002/95/EC. Available online at: http://www.rohsguide.com/rohs-substances.htm (Accessed June, 2017). Titow, W. V. (ed.). (2012). “Stabilisers: general aspects,” in PVC Technology, 4th Edn (London: Elsevier), 255–329. US EPA (1992). Characterization of Products Containing Mercury in Municipal Solid Waste in the United States, 1970 to 2000. Report EPA530-S-92-013. United States Environmental Protection Agency, 22. Copyright © 2018 Filella and Turner. This is an open-access article distributed under the terms of the Creative Commons Attribution License (CC BY). The use, distribution or reproduction in other forums is permitted, provided the original author(s) and the copyright owner are credited and that the original publication in this journal is cited, in accordance with accepted academic practice. No use, distribution or reproduction is permitted which does not comply with these terms.